There is an interesting discussion going on in the Jacob world at the moment and as I was looking through the archives, it looks like it comes up every year. Acrobatics – playing, jumping, leaping, bounding, etc. Even older ewes will get caught up in the fun. They are also very good at jumping fences, especially when they are feeling threatened or cornered. Diet – enjoy browsing, much like goats. They will eat blackberries, thistles, coarse grass, mixed herbs, etc. They benefit from a nutritious, balanced diet and it drives me crazy when people say they are a scrub sheep and can survive on very little. Sure they can survive, but are they really healthy. They do eat considerabley less then larger, more modern sheep. Condition – carry little external fat reserves on the back, but tend to store it internally when overfed. We have seen this in several sheep we have butchered ourselves. One was an older ram and the amount of internal fat was amazing!!! He didn’t look overly fat from the outside. Intelligence – alert, aware of surroundings, investigative, and learn quickly. Individuality – each sheep has their own idea of what the flock should be doing. They are more difficult to herd than other breeds. Prolificacy – singles or twins. One or two lambs are much easier to keep up with in the wild. Flushing and diet can have a huge impact on this. Mothering – quick and strong bond. Jacobs will very rarely take a lamb that is not theirs or one that they don’t perceive as theirs. Lamb survival – lambs are up quickly, feed early, and are seen playing very shortly after birth. Hardiness – resistance to parasites, disease, and stress. Self defense – prepared to defend their lambs against threat. I have a couple ewes that are ready to take me out when I check on their lambs. This is a bit extreme, but I know that they would defend their lambs to a true threat. When the primitive thread comes up, it is usually in regards to ‘what does primitive look like?’ To me this list includes – triangular head, smaller boned, sloped rump, and narrow (but not cow hocked). It is important to remember that there is more in a gene pool than just ‘what it looks like’ and this is where the list above comes in handy. If we breed just for looks, then we could be throwing out a lot of other traits that can’t be seen. 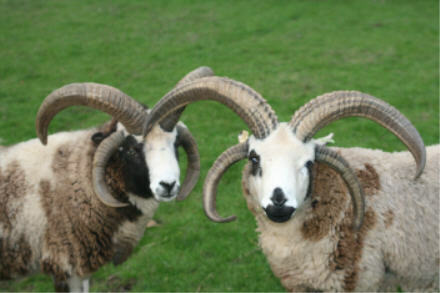 For example – these two rams have different body styles. Reno on the left is more primitive, while Wrangler on the right is more improved. The biggest difference that you can see in these pictures is the structure of their faces – Reno’s is very triangular. In person, Reno has much smaller bone and is narrower. The interesting thing is that Reno’s fleece is what I consider ‘improved’ – too fine for my liking. Wrangler’s is what I consider a truer Jacob fleece. Both of their moms are very primitive acting and Reno’s mom has a trait that I consider very primitive. When her lambs are young, she will put them in a corner at feeding time and she must give them a pretty stern lecture because they stay there until she is done eating. The rest of the lambs are running and playing, but her’s stay until she comes back for them – much like a doe and fawns. 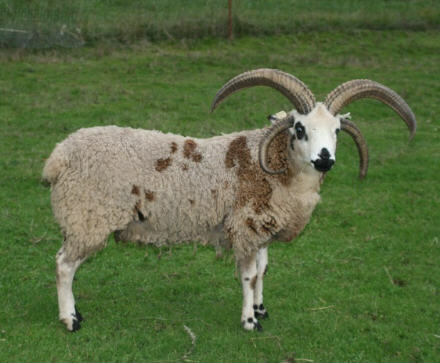 I like both of these rams for different reasons and look forward to what they contribute to the breed. I love the diversity that the Jacob breed offers and I believe there is room for many different looks and styles. Great post – thanks for organizing the traits. I sure do agree about liking the diversity and the different looks of the breed. I love my little bitty Macaroon and my great big Kayleigh and get a real kick out seeing the two of them standing together. This sounds very similar (both characteristics and discussions about them) that go on in the Shetland world. Interesting! I find myself always drawn to the primitive aspects of the breed, which is what attracted me to them in the first place many years ago. However, my less primitive Jacobs give me fleeces I love to spin and weave..yet even their fleeces are primitive in comparison with more modern and “improved” breeds. I do prefer the smaller -boned and very hardy primitive Jacobs over all and if forced to make a choice between them and the “improved” Jacobs would choose the very primitive types in a heart beat! Just don’t ever count on them doing well in any sheep shows..Jacob shows included! I was surprised to see you compare them to deer, which my primitives have always reminded me of. Great Post! Interesting point about body condition. The pictures really help to show the contrast between the two different body types. I love hearing stories about different sheep’s personalities…Reno’s mom sounds like an interesting character. Good post Shannon, especially with all the discussion flying around. I totally agree with you… love the diversity, however I am attracted to the primitive type too. They are so different to look at compared to the improved types (as well as other breeds). 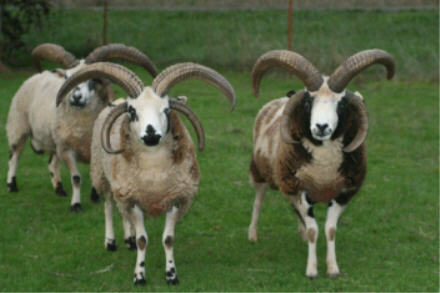 I love the horns and shape of these sheep! Our generous breed standard allows us to have several different looks to our sheep which I find interesting. Another aspect of primitive which I have not heard much about is that a primitive sheep should have a fair amount of kemp in the birth fleece that protects them against the elements (which sheds out later on). I have seen this in some of my lambs and by 4 months of age it is usually gone. This has helped them survive through some of the harsher climates they have been exposed to. Fleece should not have crimp in it to be a primitive type (I was recently told by an inspector)but it says nothing in the guidlines about type or crimp??? What’s everyones idea on that topic? Just curious.